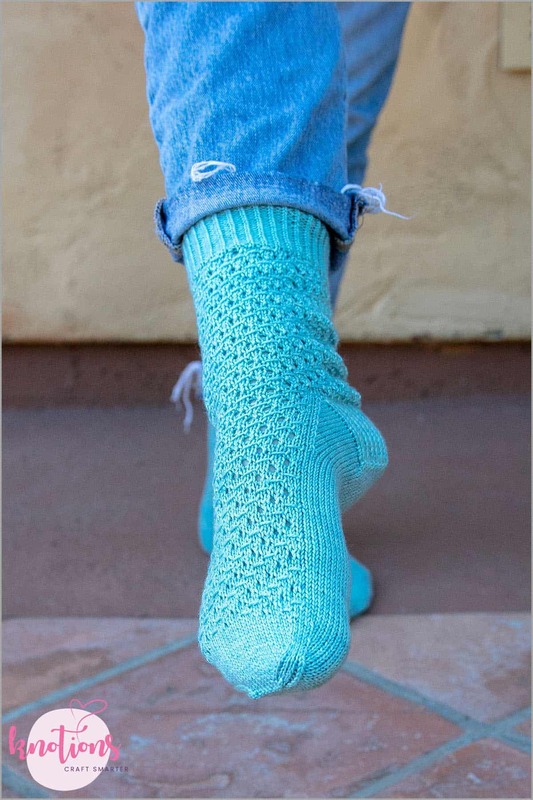 The Dodson Socks use simple stitches to create an eye-catching spiral mesh design. 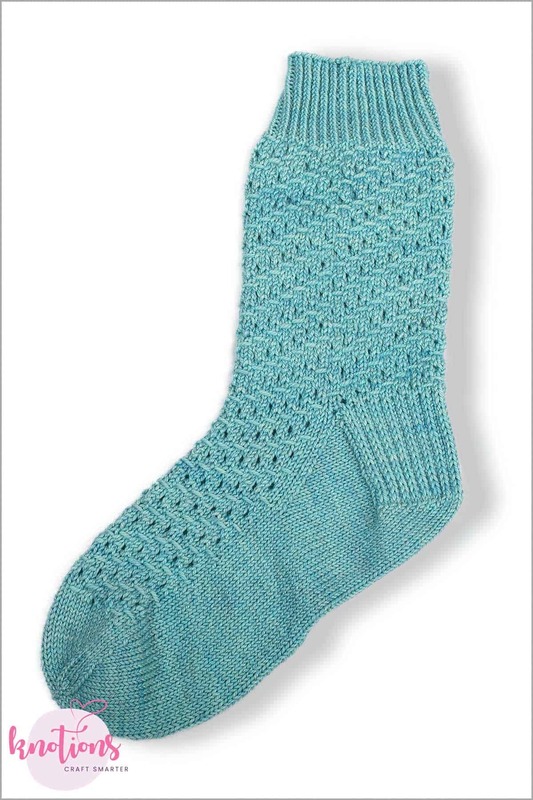 These top-down socks feature a twisted rib cuff, a heel flap and gusset, and a rounded toe. Finished Foot Circumference 7 (8, 9)” [17.8 (20.3, 22.9) cm] to fit foot circumference of approximately 8 (9, 10)” [20.3 (22.9, 25.4) cm]. 34 sts and 48 rows = 4’ [10 cm] in St st after dry blocking. CO 56 (64, 72) sts and join in the round using your preferred method for small diameter knitting. 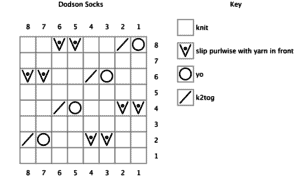 If you are using dpns, make sure to have an even number of stitches on each needle, so you don’t end up having to do a k2tog across needles! Work in twisted rib (k1tbl, p1) until cuff measures 1.5″ [4 cm] from cast on edge, or desired length. 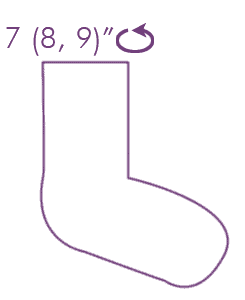 Pattern Rnd: Using the chart above or written instructions below, work the Diagonal Mesh pattern until sock measures 6 (7, 8)” [15 (18, 20) cm] total from cast on edge, or desired length. You can end after any odd rnd. 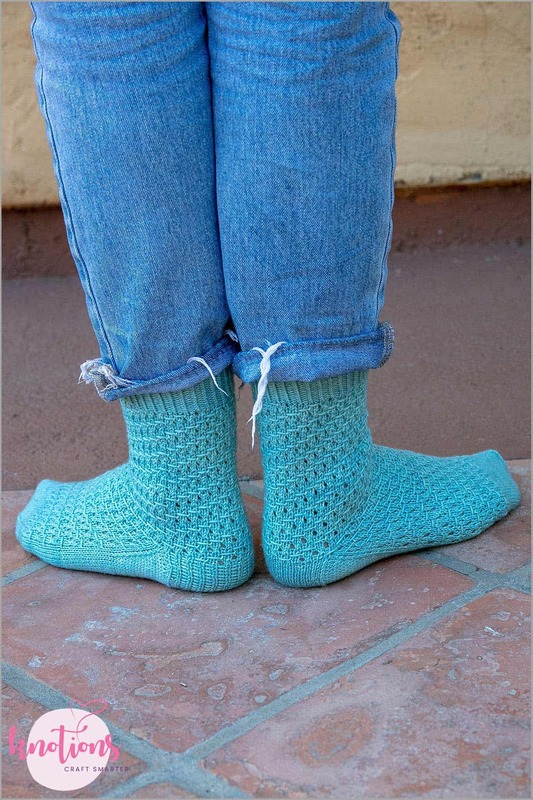 You will complete the corresponding even rnd after knitting the heel. Row 1: *Sl1p wyb, k1, rep from * to end. Row 2: Sl1p wyf, p to end. Repeat these 2 rows 13 (15, 17) more times. Note: On the last Row 2, purl the first stitch rather than slipping it. Row 1: Sl1p wyb, k14 (16, 18), ssk, k1, turn. Row 2: Sl1p wyf, p3, p2tog, p1, turn. Row 3: Sl1p wyb, k until 1 st before the gap, ssk, k1, turn. Row 4: Sl1p wyf, p until 1 st before the gap, p2tog, p1, turn. Repeat Rows 3-4 until 16 (18, 20) sts remain for the heel. 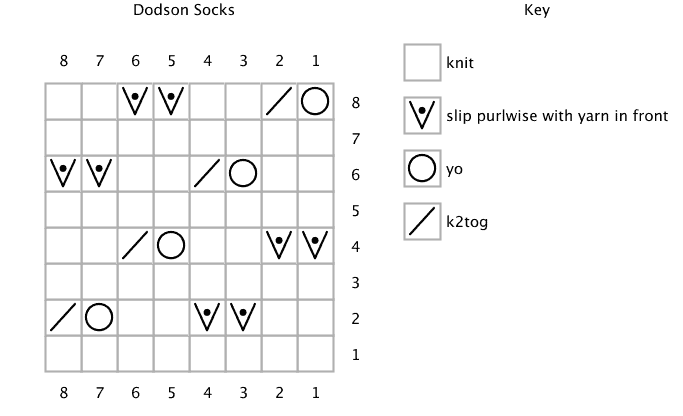 K 16 (18, 20), pick up and knit 15 (17, 19) sts along the gusset, pm, work in established** Diagonal Mesh Pattern across next 28 (32, 36) sts, pm, pick up and knit 15 (17, 19) sts along the gusset, k to m. This marks the new beginning of the round. Going forward, the first 28 (32, 36) sts will be referred to as your “instep sts”. Slip markers as you come to them. **For the medium size, you will begin working on the next rnd of the pattern. For the small and large sizes, you will pick up four rnds after where you left off, to account for the fact that you are working across the back half of the sts. For this section, you will work the Diagonal Mesh pattern across the instep sts only. Rnd 2: Work established Diagonal Mesh pattern to first m, k1, ssk, k to 3 sts before next m, k2tog, k1. Repeat Rnds 1 & 2 until 56 (64, 72) sts remain. Rnd 2: Work established Diagonal Mesh pattern to first m, knit to next m.
Repeat until sock measures approximately 2″ [5 cm] less than desired length, measuring from heel. The rounded toe is worked by gradually decreasing the number of sts. Dec rnd: K1, ssk, k to 3 sts before first m, k2tog, k2, ssk, k to next m, k2tog, k1. Non-dec rnd: K all sts. Continue with only Dec rnds until 16 (20, 24) sts remain. Kitchener the remaining sts together to close the toe. Weave in ends and block if desired. Rnd 2: *K2, sl2p wyf, k2, yo, k2tog, rep from * to end of rnd. Rnd 4: *Sl2p wyf, k2, yo, k2tog, k2, rep from * to end of rnd. Rnd 6: *K2, yo, k2tog, k2, sl2p wyf, rep from * to end of rnd. Rnd 8: *Yo, k2tog, k2, sl2p wyf, k2, rep from * to end of rnd. An auditor by day, Caitlin Griffin is always anxious for a creative outlet by the end of the work week. She began knitting in 2014 and began designing her own patterns not long after, as she could never find the right pattern for what she envisioned. Caitlin enjoys the challenge of creating designs that result in an intricate and detailed product but are simple and fun to knit. She lives just west of Boston with her boyfriend and two yarn-loving cats, Tony and Leroy. 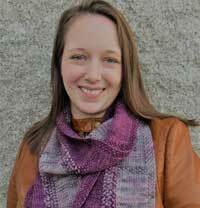 Besides knitting, she enjoys barre, yoga, reading and attending the occasional Red Sox game. She can be found on Ravelry and Instagram as caitgdesigns.